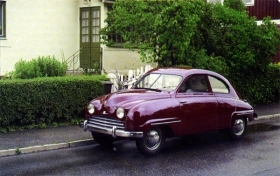 Spyker's Muller wants a new small car for Saab, inspired by the Saab 92, shown. STOCKHOLM (Bloomberg) -- Spyker Cars NV, Saab Automobile's owner, is in talks with automakers to share technology and a platform for a new car based on a 1950s Saab model, CEO Victor Muller said. The new small car would be tear-drop shaped, inspired by the Saab 92 model that was in production between 1949 and 1956, he said, declining to say with whom he's been negotiating. Spyker, the Dutch maker of supercars, bought Saab in February from General Motors Co., completing a 14-month effort by GM to either unload the company or close it down. Saab, which begins selling the new 9-5 model May 31, has spent the last three months restarting production and severing the GM ties. Saab aims to sell between 50,000 and 55,000 cars this year, of which 17,000 would be the new 9-5, Muller said. Next year Saab targets sales of 100,000 cars, including 40,000 9-5s and about 10,000 9-4X, a midsize crossover SUV to be built at a GM plant in Mexico starting in April 2011, he said. Spyker, after considering the U.K. and Sweden, is leaning towards moving its stock listing to Stockholm from Amsterdam, Muller said, explaining just a fraction of its business remains in the Netherlands. Saab aims to reach an agreement with a Chinese distributor within a couple months, he said, denying media reports this week that Saab and Beijing Automotive Industry Holding Co. have reached a distribution deal.